Zesta Kitchen’s elegant Mondo Kitchen takes its cue from the European market. The smaller spaces prevalent in urban Melbourne drove us at Zesta to create a kitchen design that focusses on the economy of space, and a sleek, no-frills motif. This kitchen features flat, horizontal lines, to accentuate the size of the space. Cabinetry has a flat presentation and fold-out access, while lighting is equally efficient, incorporating soft backlights to illuminate corners. And the appliances here are also on the small side, hidden among the wall cabinets, to allow for easy and free movement while at work here. An ergonomic and space-saving stove hood comes in translucent glass, appearing to reduce the clutter, and contributing to a sensibility that avoids many frills. The gleaming bench top is a glossy white, constructed of ultra-durable substances to last better, and which contrasts well with the stainless steel outlines and handles of the cabinetry and the stove hood. This stylish design is gaining in popularity among the urban set in Melbourne, particularly in the high-density populations of the central business district, but also among those who simply prefer its functionality and use of space. 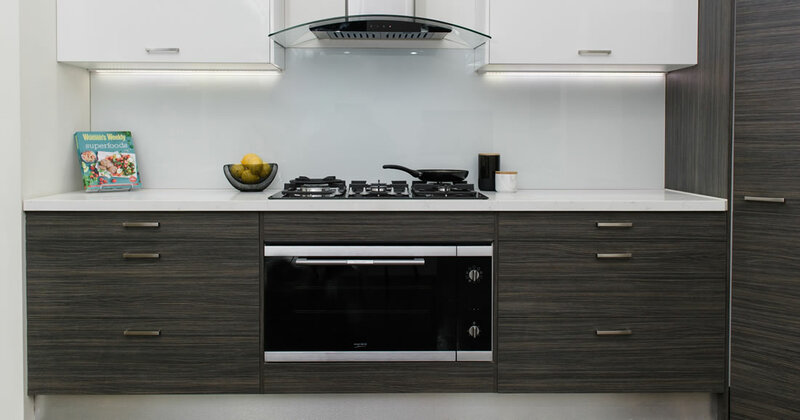 If it sounds like a suitable fit for your home, Zesta Kitchens can make it happen. The Infinity kitchen design could be an ideal fit for your Melbourne home.